Trillions of microbes make their homes inside our bodies, and neither of us would survive without each other. Opening January 27, the Delaware Museum of Natural History&apos;s new special exhibit, Zoo in You: The Human Microbiome, explores this fascinating and complex world inside us, a dynamic, adaptable, and delicately balanced ecosystem much like any other found in nature. At Zoo in You, visitors learn who our constant microbial companions are, where they live, how diverse they are, and in what ways scientists are discovering just how important they are to our personal health. Zoo in You has three thematic areas: Meet the Microbes, Our Complex Ecosystems, and Exploring our Microbiome. 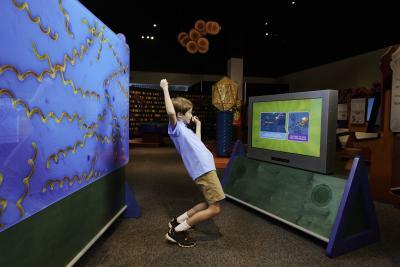 Visitors are taken on an interactive journey to learn all about the four major types of microbes that live in and on us! From bacteria to archaea, fungi to viruses, these tiny non-human organisms outnumber our human cells ten to one. Through hands-on activities, visitors can learn about "good" microbes, watch how our microbiome reacts to every day occurrences, and manipulate a marble maze to learn how a newborn baby is first colonized by microbes. Delve deeper into the lives of microbes with green screen technology to get a "weather report" on the climate conditions of your nose, mouth, gut or skin, and a touch-screen video game that challenges guests to keep gut microbes in balance. Adults and kids alike are invited to explore the eye-opening hand "washing" station to observe just how long it takes to be free of germs. Visitors can get up close and personal with microbes as they answer tough questions and use a microscope to examine real preserved specimens. 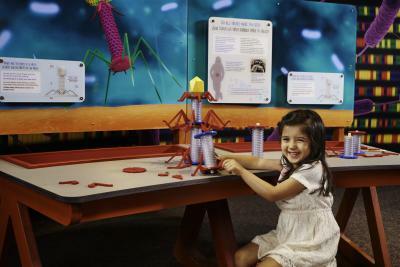 Visitors can also build their own viruses using puzzle pieces, assemble DNA strands as quickly as possible, and even try their hand at matching DNA patterns to the correct microbes. Plus, a unique photo opportunity allows guests to imagine what they would look like as a microbe. Zoo in You was produced and is toured by the Oregon Museum of Science and Industry. This exhibit was made possible by a Science Education Partnership Award (SEPA) from the National Institutes of Health (NIH). Locally, Zoo in You is sponsored by DuPont and the Delaware College Investment Plan. WHAT: Zoo in You: The Human Microbiome special exhibit. TIME: Monday-Saturday 9:30 a.m.-4:30 p.m.; Sunday noon-4:30 p.m.
free for babies younger than 12 months. Free admission for Delaware Museum of Natural History members. The Delaware Museum of Natural History opened its doors in 1972 to excite and inform people about the natural world through exploration and discovery. The Museum houses Delaware&apos;s only permanent dinosaur display, surrounded by exhibits of mammals, shells, and other specimens from around the world. The museum cares for world-renowned scientific collections of mollusks and birds, including one of the top-fifteen mollusk collections in the United States. For more information about the Delaware Museum of Natural History, visit their webpage at delmnh.org, and follow them on Facebook or Twitter.